There is some good news for Professor Layton fans in the EU with confirmation that the series prequel, Professor Layton and the Last Specter, now has a confirmed release date of 25th November in UK and Europe. It will launch with the alternate title Professor Layton and the Spectre's Call. The game will have been out in Japan for just shy of two years when it arrives, so good things do come to those who wait. Unfortunately, the news that the Professor Layton's London Life extra game won't be included is still the case, so gamers in North America can enjoy that exclusive content along with Japan. It's a strange quirk of fate that DS gamers living in London won't get to play this substantial extra, but Nintendo's press release promises a raft of content to satisfy fans of the series. Professor Layton and the Spectre’s Call is bursting to the brim with brand new puzzles to challenge and delight both seasoned Professor Layton fans and those new to the series. The exciting storyline, set three years before the events of Professor Layton and the Curious Village, follows the story of how Professor Layton first met his soon-to-be trusty assistant Luke. 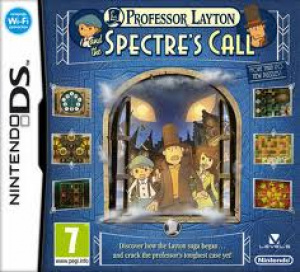 Players will also be introduced to Layton’s female assistant, Emmy, who is keen to work with him to discover the mystery behind the Misthallery spectre. The more puzzles you solve, the closer you will get to cracking Layton’s latest mystery. With more Layton on the way to 3DS in 2012 with Professor Layton and the Mask of Miracle, these are good times for puzzle fans. No London Life for London gamers? Trolololololo. No London Life for Europe is friggin stupid. Could always import I guess...but they hate the US Luke voice...ouch. Way too late.. they just want me to use a ROM. The no London Life thing is very very odd...why not have it in there? @MetalMario : Probably because there's too much to translate 5 languages total) and they wouldn't want to delay it more probably... Or they are just too lazy. Wow, i'm dying to play this, even without London Life. Just over two months for them to change their mind and put London Life back in! I'm importing anyway, so it's not a huge issue, but I will most likely pick this one up down the line. The way that they're not including London life is so annoying! If they could translate Xenoblade chronicles into 5 different languages the why not this? I'm still not prepared to import the US version though as I can't stand Luke's version in the US versions of the series. Maybe London Life isn't any good? Who cares about the EU release date!? I want the full experience. It's just ridiculous that Nintendo of Europe makes such tremendous cuts in a triple A game nowadays. Every European Nintendo fan should boycott this and import the US release. Why can't Nintendo include just the English version of London Life in Europe? The other translations are dispensable for many gamers. Having heard both voices, I actually prefer the US version of Luke, he sounds less cockney stereotype, oddly enough. I was thinking of importing, but I think I'll wait and see. I don't know if this London Life thing is even any good. Still think it's so weird that they're not just using the US translation and bringing that over here; most countries in Europe don't have the option to play the rest of the series in their own language, and have already been forced to play the games in English, anyway. Instant buy... although I consider importing the American version as I want the complete game. Also I like the English vocals way more then any Dutch-language version. Furthermore I'm sure the American import will be cheaper than the European version which I am sure will be €40,- euro. I'll definitely import the US version, since Aussies won't get this for a while anyway, and I'm not missing out on London Life. I'll get the EU version, London Life or not. Can't stand Lani Minella as Luke's voice. I could go for the American version (if that's a option for me), but then I have to do without the weekly puzzles. But then, what's better: Free puzzles, or a 100 hour long bonus rpg. The latter of course! I much, much prefer the box art of the UK versions (and I have the previous three games from there) but it feels a bit wrong to pay for a game missing such a huge amount of content. I wonder if London Life is actually any good but even so, it's the principle of the matter. I guess I'll grab the US version and maybe pick up the UK one down the line if I see it cheap. Where is London exactly? In Europe? Idiots!